Many people do not realize is that street art can take the form of a performance. It does not have to be the illegal application to a medium to a surface. Generally though, street art performances only happen once, and they don’t last very long. Because of that, video documentation is essential to spreading the word about any performance after the fact. Improv Everywhere are masters of performance-based street art. They put on unique performances that absolutely astound their unassuming audiences. One example is Frozen Grand Central, probably the group’s most famous performance and one of their most impressive. For the piece, they gathered about 200 people into New York City’s Grand Central Station who, at a specified time, froze still as if time had stopped, and then, again simultaneously, unfroze and carried on as if nothing had happened. If you were there, I’m sure it was amazing. But given that the video documenting the action has tens of millions of views on YouTube, it’s obvious that most of the people who have seen Frozen Grand Central saw it on video, not live. Charlie Todd, Improv Everywhere’s founder, credits the group’s success and popularity largely to YouTube. He has said, “When YouTube came along, it was just the greatest thing that could have possibly happened to us because the only way you could see these projects is you would have to come to my apartment, I would take my tape out, put it in my camera, and make you watch it. The audience was just me and one friend at a time. I could get together with my friends, come up with an idea, go execute it with no permission, with no authorization, with no one’s approval or green light, and we could record it ourselves, and we could upload it to YouTube, spend virtually no money, maybe no money, and potentially have it seen by millions of people.” Once again, sharing documentation online took something from local event to global phenomenon, with a 5-minute long performance initially witnessed by maybe just a few hundred people becoming one of the most seen artworks of the decade. F.A.T. Lab’s version of the Google Street View car. Photo courtesy of F.A.T. Lab. A variation on unauthorized public performance with more of a conscious involvement of the Bored at Work Network as audience and participants was F.A.T. 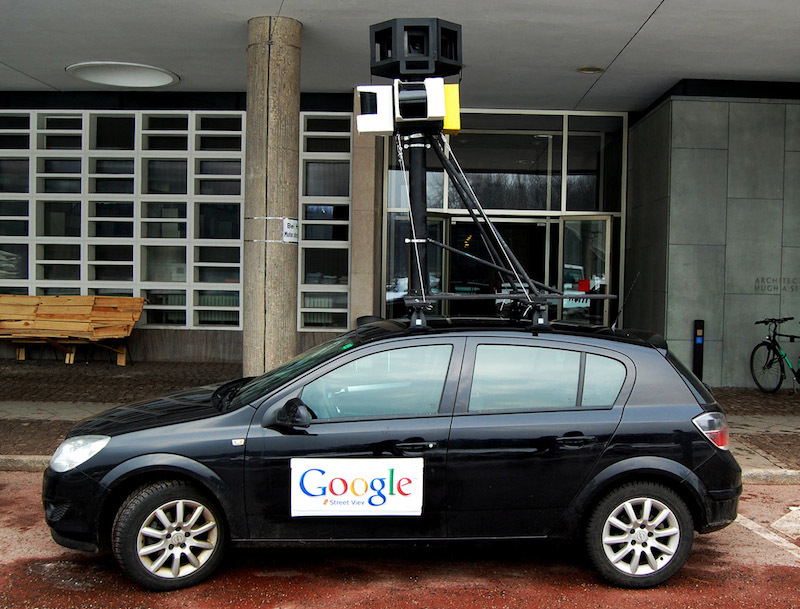 Lab’s fake Google Street View car project, which took place in Berlin in 2010. The F.A.T. Lab members rented a car and outfitted it to look nearly identical to the cars used by Google for their Google Street View feature. They simultaneously tweeted that they had spotted a Google Street View car and had equipped it with a GPS tracking device that would upload the location of the car to a publicly accessible website. Craziness ensued. The lab’s fake Street View car and its operators blocked traffic, almost ran into people, got heckled, and just generally behaved in ways that Google would not appreciate its employees behaving. Members of the public (and press) reacted with gusto to F.A.T. Lab’s news and the actions of the supposed Google employees. A discussion about privacy and Google Street View was brought into the media spotlight, and it appears that members of the public tracked down the car to get caught on camera making obscene gestures or walking around with their pants down in protest of Google (or just for fun). The performance took place both online and offline, and it relied on the internet for much of the audience and media attention that F.A.T. Lab was aiming for, and now the video of the in-person antics can be seen online, continuing the debate that F.A.T. Lab wished to spark even after the work has been revealed as a hoax.